The Bell of Atri. 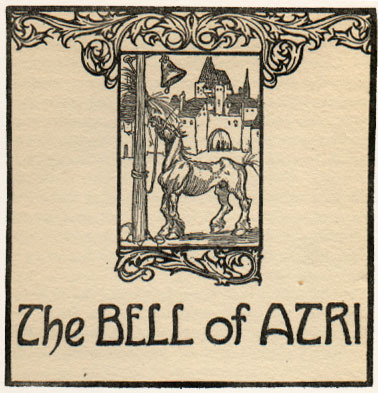 The Bell of Atri. 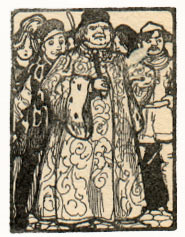 From: Folk Tales From Many Lands. retold by Lilian Gask (1865-). Illustrations by Willy Pogany (1882-1955). New York, T.Y. Crowell & Company  pp. 25-28. WISE and just monarch was the good King John. His kingdom extended over Central Italy, and included the famous town of Atri, which in days gone by had been a famous harbour on the shores of the Adriatic. Now the sea had retreated from it, and it lay inland; no longer the crested waves rolled on its borders, or tossed their showers of silver spray to meet the vivid turquoise of the sky. he great desire of good King John was that every man, woman, and child in his dominions should be able to obtain justice without delay, be they rich or poor. To this end, since he could not possibly listen to all himself, he hung a bell in one of the chief towns, and issued a proclamation to say that when this was rung a magistrate would immediately proceed to the public square and administer justice in his name. The plan worked admirably; both rich and poor were satisfied, and since they knew that evildoers would be quickly punished, and wrongs set right, men hesitated to defraud or oppress their neighbours, and the great bell pealed less often as years went on. In the course of time, however, the bell-rope wore thin, and some ingenious citizen fastened a wisp of hay to it, that this might serve as a handle. One day in the height of summer, when the deserted square was blazing with sunlight, and most of the citizens were taking their noonday rest, their siesta was disturbed by the violent pealing of the bell. "Surely some great injustice has been done," they cried, shaking off their languor and hastening to the square. To their amazement they found it empty of all human beings save themselves; no angry supplicant appealed for justice, but a poor old horse, lame and half blind, with bones that nearly broke through his skin, was trying with pathetic eagerness to eat the wisp of hay. In struggling to do this, he had rung the bell, and the judge, summoned so hastily for so light a cause, was stirred to indignation. "To whom does this wretched horse belong?" he shouted wrathfully. "What business has it here?" "Sir, he belongs to a rich nobleman, who lives in that splendid palace whose tall towers glisten white above the palm-grove," said an old man, coming forward with a deep bow. "Time was that he bore his master to battle, carrying him	dauntlessly amid shot and	shell, and more than once	saving his life by his courage and fleetness. When the horse became old and feeble,	he was turned adrift, since	his master had no further	use for him; and now the poor creature picks up what food he can in highways and byways." On hearing this the judge's face grew dark with anger. "Bring his master before me," he thundered, and when the amazed nobleman appeared he questioned him more sternly than he would have done the meanest peasant. S it true," he demanded, "that you left this, your faithful servant, to starve, since he could no longer serve you? It is long since I heard of such gross injustice–are you not ashamed?" The nobleman hung his head in silence; he had no word to say in his own defence as with scathing contempt the judge rebuked him, adding that in future he would neglect the horse at his peril. "For the rest of his life," he said, "you shall care for the poor beast as he deserves, so that after his long term of faithful service he may end his days in peace." This decision was greeted with loud applause by the town-folk, who gathered in the square. "Our bell is superior to all others," they said to each other, with nods and smiles, "for it is the means of gaining justice, not only for men, but for animals too in their time of need." And with shouts of triumph they led the old war-horse back to his stable, knowing that for the future its miserly owner would not dare to begrudge it the comfort to which it was so justly entitled.